Dining is a daily part of life, but it’s often treated as a routine of physical necessity rather than a mindful experience. In our increasingly fast-paced, takeout food-centric world, we invite you to slow down and reexamine the ritual of eating through a special celebration of handcrafted ceramic-ware. Check out our Social Media (Facebook and Instagram) or Facebook Event to see sneak peeks of the artists’ work included in this year’s CRAFTED collection. 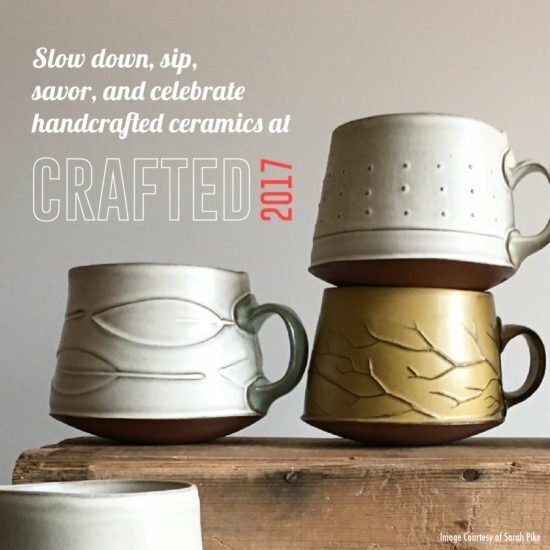 Get first pick on the beautiful, functional ceramic artworks featured in CRAFTED at its opening reception on Friday, November 3, 6 – 8PM!